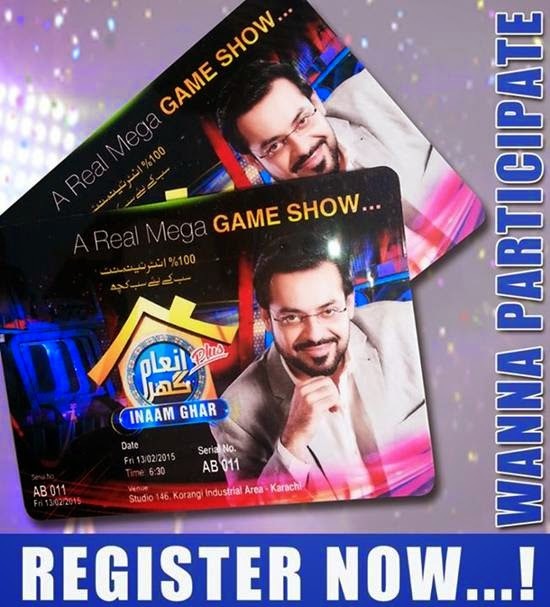 Home / Aamir Liaquat / Geo TV / Inaam Ghar / TV Programs / TV Show / Win Prizes / Inaam Ghar Plus - How to Register for this TV Show? 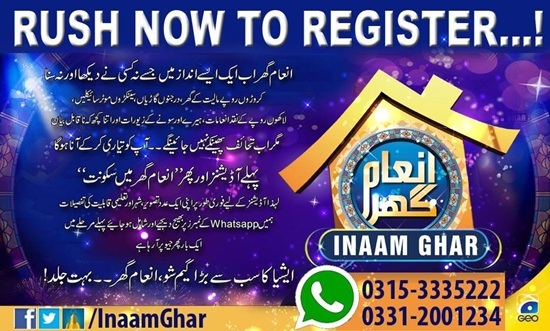 Inaam Ghar Plus - How to Register for this TV Show? "Inaam Ghar Plus" is the second season of famous mega show Inaam Ghar. Dr. Aamir Liaquat Hussain has come once again, with his famous TV Show with a lot more fun and games. Inaam Ghar Plus is started on Geo TV from 13th February, 2015. In order to participate, you can register online to further ease the registration process. This will give everybody a fair chance to take part in the program and win free prizes. The show will be aired on every Friday and Saturday at 07:30PM on Geo Entertainment. How to Register for Inaam Ghar Plus? Fill out online registration form that is for a single entry. You are required to fill out their names, city, address, education, gender, CNIC number, age, mobile number, email address and will also have to attach your picture. After completing the process, just click on the submit button to complete the process. You will be asked, If you have any family members whop would like to come along with you? Select Yes or No. If you select Yes you can add details of maximum 04 family members with you. On completion of the registration process, you will receive an SMS from Geo TV confirming your registration. The applicants who want to participate in the show, will however have to fulfill certain conditions. They should be older than 12 years old. Inaam Ghar Plus entry passes cannot be sold. Seats on Inaam Ghar Plus TV Show are available on first come first basis. Maximum 4 members of a family can participate in Inaam Ghar Plus. Beware of forgery! GEO network will not be responsible in case of any mishap.